In conjunction with the SPWS exhibit at the Queens International 4, SPWS invited artists Andrea Polli and Chuck Varga to install a Professional Weather Station on the QMA rooftop as part of the ongoing Hello, Weather! Project. Readings from the station will be used in the ongoing operations of SPWS and Hello, Weather! 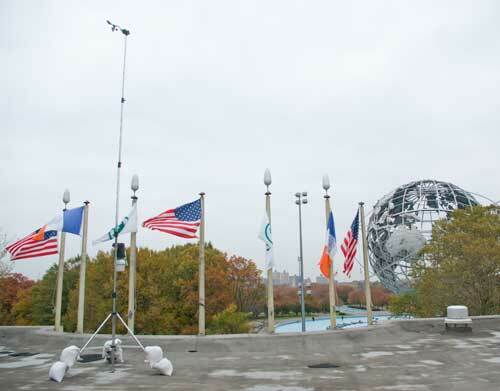 The Davis Vantage Pro 2 weather station on the Queens Museum roof logged data on a local computer and uploaded continuously to online weather communities such as PWS Weather, Weather Underground, and Citizen Weather. Inside the museum, console monitors displayed live camera feed and software showing data acquisition from the QMA rooftop station. Previous Hello, Weather! stations have been installed at Eyebeam, NYC; the University of Colorado Boulder; and rooftops in Long Island City, Queens.